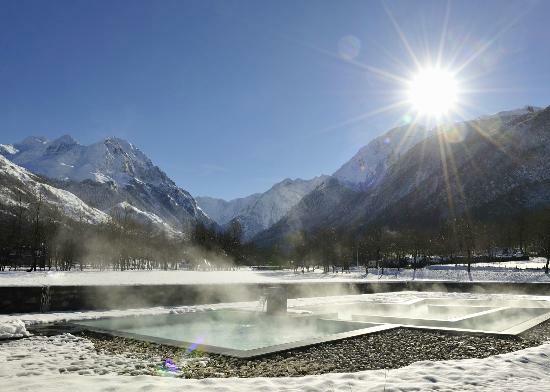 A French Perspective » Discover France » The French Pyrenees: The ski destination no one talks about! It is still skiing season and we just cannot wait to get our tablet or smartphone ready for lunch break and start browsing around for great all-inclusive deals to the Alps! Let’s be honest, we all love hating the cold days as we know they give us the perfect excuse to book an adrenaline- packed holiday followed by delicious cosy food and probably some after-ski drinks! It is so cold…so it is all allowed! 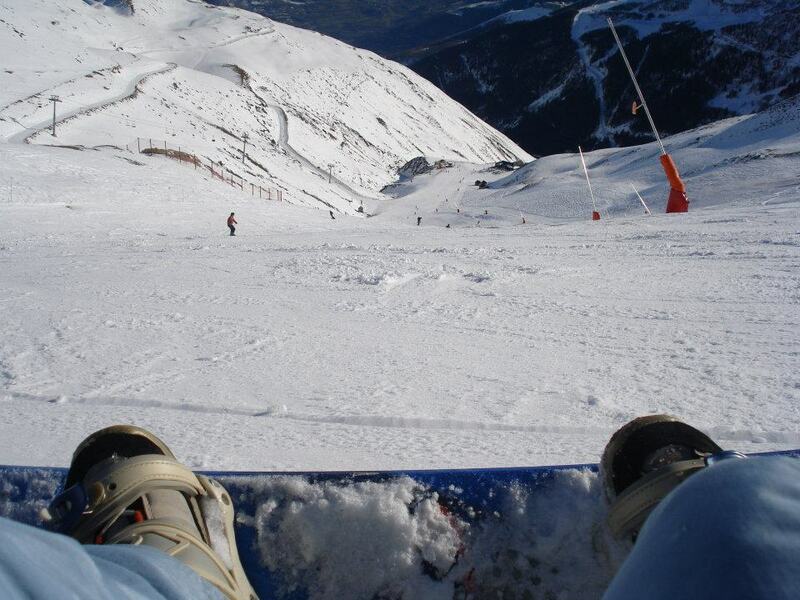 Getting ready on my snowboard to enjoy the slopes in Siant-Lary! But why not being different for once? If you are not keen on going to France and only hear people speaking English, and feel like one more in the massive queue, eating in cantine-like restaurants but, instead, what you really want is to get the real French experience… then you must pack your skis to the Pyrenees in the South of France! The Pyrenees are the smaller version of the Alps, so yes, let’s say it, the ski resorts are smaller, however they offer more than enough kilometers of slopes to get the full skiing experience! But what really makes the Pyrenees so special to me is that you can enjoy great days on the slopes and combine them with pretty little escapes to the picturesque French villages to immerse yourself in the typical French culture. 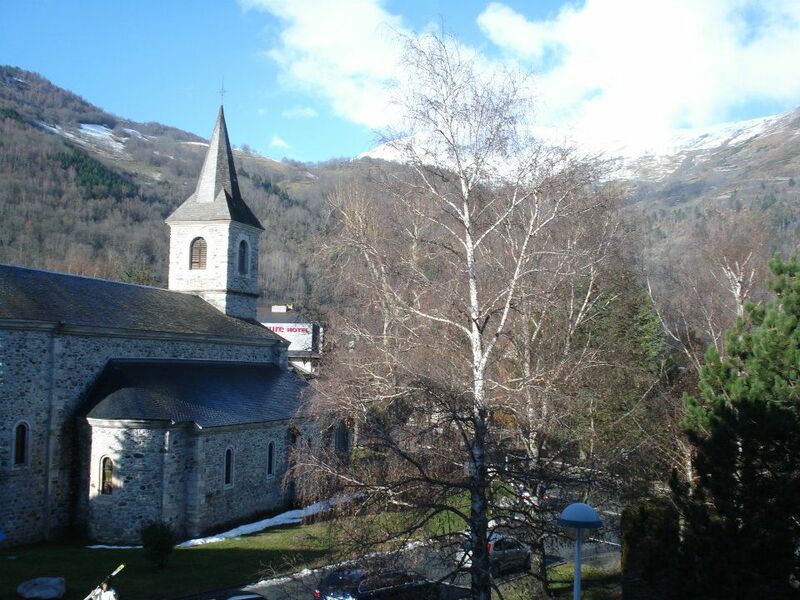 The little medieval church in Saint-Lary from my hotel room! So where to start looking? Well, it is difficult for me to chose from as every single station de ski has something very special to offer. But it is a good idea to think about the big picture: consider the Pyrenees as a different winter holiday destination and not only like a flight-bus-skiing (+party) experience type, be ready to embrace the pretty surroundings while you get to enjoy great slopes too! Let’s say you start your journey from the UK: you can fly into Toulouse, Lourdes-Tarbes or to Pau. Then I would definitely recommend to rent a car in order to discover the surrounding region. All airports are at about 1 hour drive, and what a beautiful drive! You can also fly into Paris, spend some time in the Capitale de l’Amour and take a TGV (fast train) to Tarbes where buses are in place to drive ski addicts to the main stations. 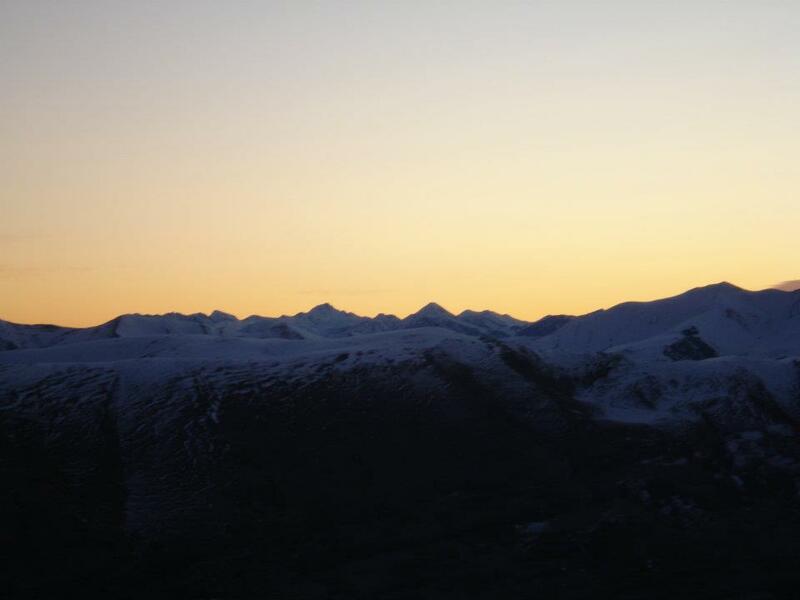 Amazing sunset views of the Pyrenees shade from my hotel room in Saint-Lary. Now that you know that the Pyrenees offer smaller but great ski resorts, that there are a very French locals orientated destination, that the transports (and English speaking people) are rarer than in the Alps but that you will find amazing landscapes, typical gastronomy, friendly people and enough skiing slopes then… let’s get started! On my last holiday I enjoyed flying from London to Toulouse where I spent one night (if you go around Christmas time there is a wonderful Christmas market on the Place du Capitole, the main square). You can discover the medieval architecture while shopping and enjoying some drinks and food in the little bistrots and indulge yourself with their famous cassoulet! 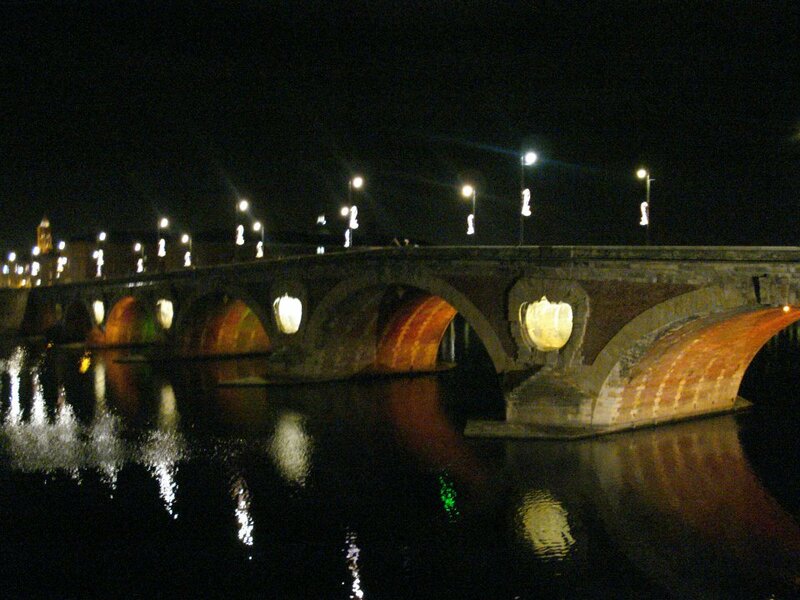 I always enjoy walking in Toulouse by night. Photo taken just before my first Degustation de Cassoulet of the year! Saint-Lary is a very postcard-perfect mountain village where you can live the real french experience and ski like a pro during the day! The village offers all type of accommodation from nice value for money (wifi equipped) hotels, to family apartments or typical houses to rent. What I loved the most about Saint Lary is the nice set up: small little streets, typical pyrenean grey stoned architecture and the people… so friendly…! Everything is there for you: sport shops, supermarkets, cinema, bars, a thermal SPA, a wide range of typical restaurants etc… The skiing facilities are amazing! Especially the impressive gondola that takes you from the village to the actual slopes! A skiing holiday to Saint-Lary is to me, a quiet and charming destination where you can combine excellent skiing facilities with a relaxing and indulgent French cultural experience! But if you want to make the most of your stay, jump into your rental car and follow my top 3 things to do around Saint-Lary! 3. Try the neighbor ski resort Peyragudes (in fact is a short by mind-blowing ride along a mountain river ). The great side of the Pyrenees is the short distance in between ski resorts. Every station de ski is kind of different so I you have rented a car, you can experience new snow sensations in Peyragudes! 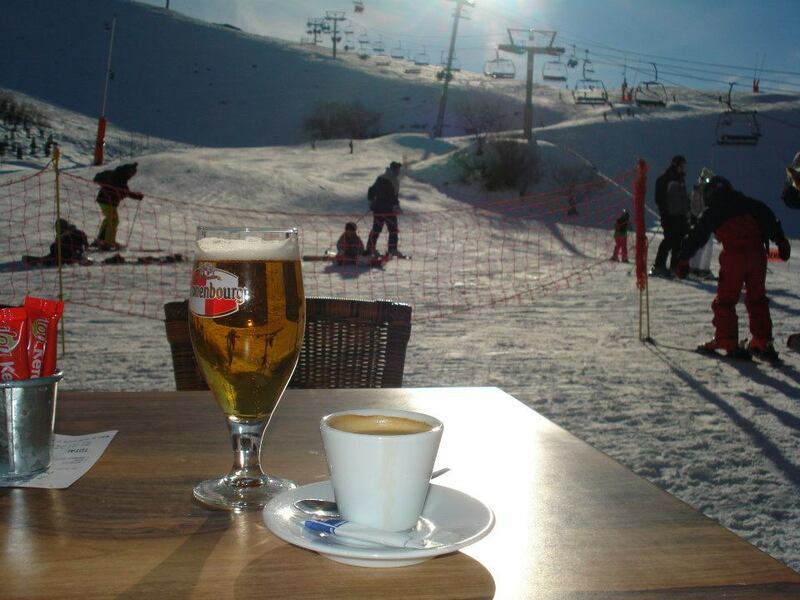 I love enjoying an afternoon break at the coffe terraces down the slopes in Peyragudes! 2. Get lost in the surrounding countryside. Yes, don’t be shocked.. this is one of my best tips! Of course, don’t try to get adventurous if its bad weather or snow alerts, but if you are lucky and it is sunny there is nothing better than drive and stop by the historical villages, small lakes and crystal clear mountain rivers: pack your walking shoes and some euros in case you get tempted at the boulangerie or at the boucherie! Some winter afternoons cat get sunny and -kind of warm- in the Pyrenees! Tagged France, holiday in France, Luxury Experiences.